Before delving into the fascinating SVBIED designs constructed and used by the Islamic State contingent in Libya, I’ve decided to dedicate the first section of this article to the history behind the group’s rise and decline in this north-African country. Historical knowledge surrounding this is imperative in order to be able to put these designs into their context and to understand their origins. After the downfall of Muammar Gaddafi’s regime in Libya in early 2011 following a hasty NATO intervention during the Libyan Civil War, a large number of Libyan rebels travelled to Syria in order to join the fight against Bashar al-Assad’s regime. There, a number of the Libyan foreign fighters coalesced into the “Battar Brigade” the following year. In the spring of 2014, many Battar Brigade veterans returned to Libya and formed the “Islamic Youth Shura Council” in the eastern port city of Derna. In September the same year, a senior Islamic State delegation (including Abu Nabil al-Anbari (who later became leader of IS in Libya) and Abu Habib al-Jazrawi among others) was sent to Libya in a mission to collect pledges of allegiance, thereby expanding their territorial grasp of the country. The next month, the Islamic Youth Shura Council pledged allegiance to IS, and paraded through Derna in a convoy of 60 technicals after seizing control of the city. In November, IS leader Abu Bakr al-Baghdadi released a speech in which he accepted the pledge of allegiance, announcing the formation of three IS provinces (‘wilayat’) in Libya: Wilayah Tarabulus (Northwest), Wilayah Barqah (East), and Wilayah Fezzan (Southwest). The most active wilayat in the following years were Tarabulus and Barqah that both cover the northern coast, with little military action occurring in the desert hinterland of wilayat Fezzan. After IS announced their presence in Libya, IS foreign fighters of Libyan origin in Syria were dispatched back to their home country in order to assist in the building of the north-african satellite wilayat. Map showing the traditional Libyan provinces. 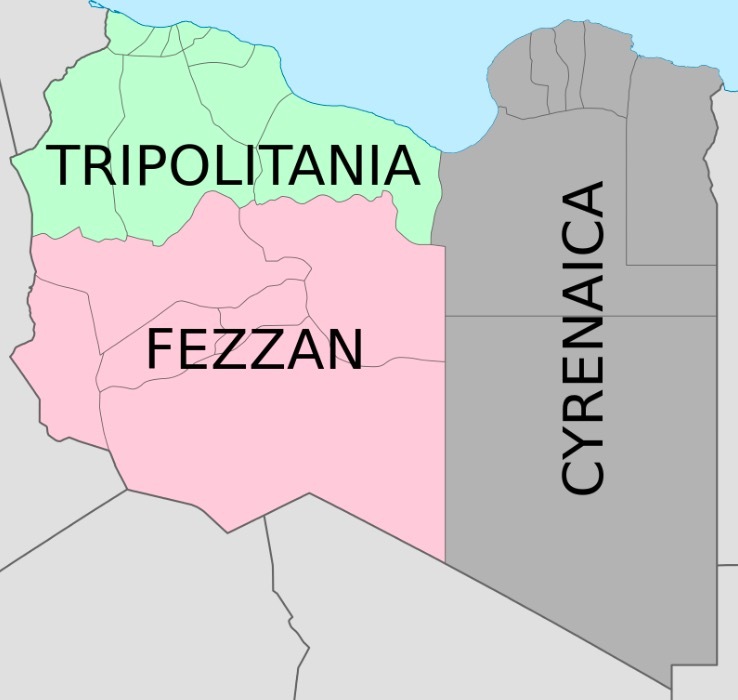 Cyrenaica corresponds to Barqah while Tripolitania corresponds to Tarabulus. The Second Libyan Civil War that has been going on since early 2014 is a very complex situation. As I can’t claim to have fully grasped all the political and military intricacies, I won’t dive into it extensively in this article. However, it’s important to note that the strongest military actor of the ongoing conflict is General Khalifa Haftar’s Libyan National Army (LNA) that controls all of Eastern Libya. On the other side of the conflict is the Libya Dawn Coalition and other assorted militias based out of Tripoli in the country’s West. In mid-December 2014, more than half a year after the breakout of clashes between these factions, territorial control was roughly equally divided between the two, with the LNA at a slight upper hand. At around this time, IS recruiters in Turkey urged their Libyan counterparts to stop sending fighters to Syria and to instead focus on building their local Libyan wilayat. IS contingents in Libya made tactical alliances with AQ-linked groups such as Benghazi-based Ansar al-Sharia in order to hasten their acquisition of territory. In February 2015, IS fighters swooped in from the desert and seized the northern port city of Sirte, a city that would become IS de-facto capital in Libya. At this stage, IS in Libya were simultaneously using covert SVBIEDs in attacks against targets in areas held by opposing forces (e.g. Misrata), while also employing up-armored SVBIEDs in areas where they already held territory (e.g. Benghazi). This two-sided use of SVBIEDs is a commonly seen feature of non-state actors using SVBIEDs achieving prominence, and has been observed with IS in Syria/Iraq as well as with Jabhat al-Nusra (now HTS) in Syria. IS in Libya sought to expand their territorial control surrounding Sirte, and had a year later in early 2016 managed to carve out a sizeable piece of territory surrounding Sirte. 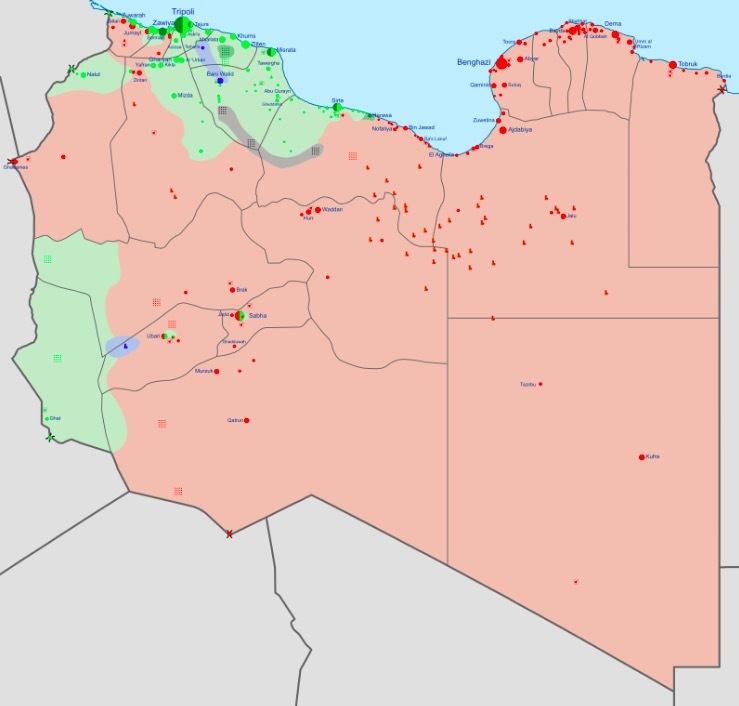 Map displaying IS territorial control in Libya in mid-February 2016. However, this was also when their overt decline picked up pace. IS had already been driven out of Derna in July 2015, before losing their leader Abu Nabil al-Anbari to an American airstrike in November the same year. In December 2016, after a 7-month long siege backed by US airstrikes, IS lost control of Sirte and its surrounding areas, withdrawing into the deserts south of the city. In early January the following year, the remaining IS fighters in Benghazi withdrew from the city after more than two years of clashes. After losing their territorial holdings, IS in Libya have since retreated to secret hideouts in the desert hinterland, engaging in low-level clashes and occasionally conducting covert SVBIED attacks against opposing forces in the country. 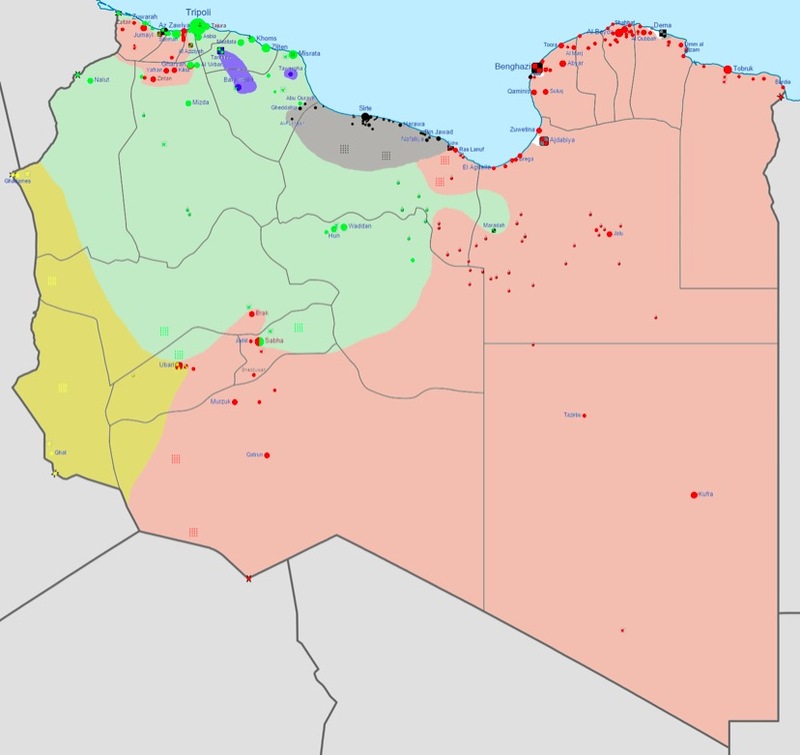 As of early November 2018, LNA has also increased their territorial grip of Libya, inching closer to the Libyan Dawn coalition and its allies in the Tripoli area. Map displaying territorial control of Libya as of November 7, 2018. As part of my research for this article, I gathered all available imagery of (S)VBIEDs used by or captured from IS in Libya. 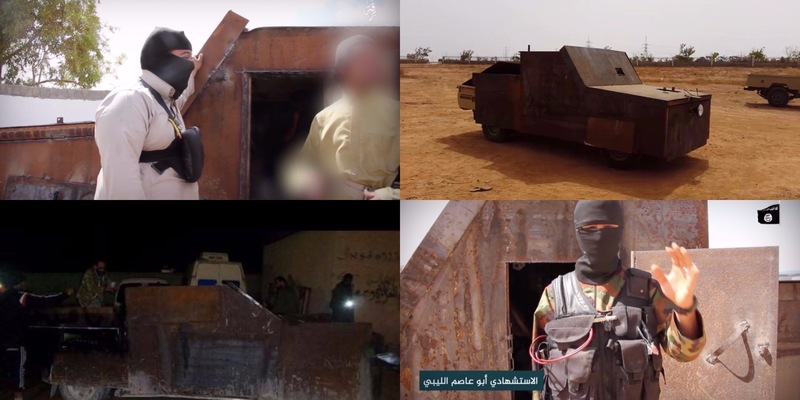 This included watching all official videos released by the media departments of the Libyan wilayat, as well as scouring through multiple social media platforms in search of imagery detailing examples of captured (S)VBIEDs. In doing this, I was able to find footage of at least 37 separate (S)VBIEDs of varying designs used by or captured from IS in Libya between early 2015 and late 2018. Of these, 16 were covert (S)VBIEDs, while the other 21 were up-armored (S)VBIEDs. In this section I’ll be discussing most vehicle types in-depth. In essence, the distribution of shell vehicles roughly mirrors the early distribution of IS in Syria and Iraq, with pick-up trucks responsible for the biggest share (17), followed by heavy trucks (8). The rest of the shell vehicles were a mix of SUVs, regular cars, flatbed trucks, as well as a single front-end loader. The biggest difference lies in the payload design, which will be discussed further down. Pick-up trucks made up the majority of shell vehicles in this data set, with 17 being of this vehicle type. Most of these vehicles were used by or captured from IS in Benghazi and Derna, with a couple in the Sirte region as well. The first examples were used by IS in Benghazi in late March 2015 and displayed no real uniformity design-wise. Still, the bottom-left example seems to have been fitted with armoured glass for the driver’s viewing port. Transplanting armoured glass from seized armoured vehicles was a fairly common practice by IS in Syria and Iraq. However, beginning in early 2016, up-armored pick-up trucks carrying identical armor kits began appearing. 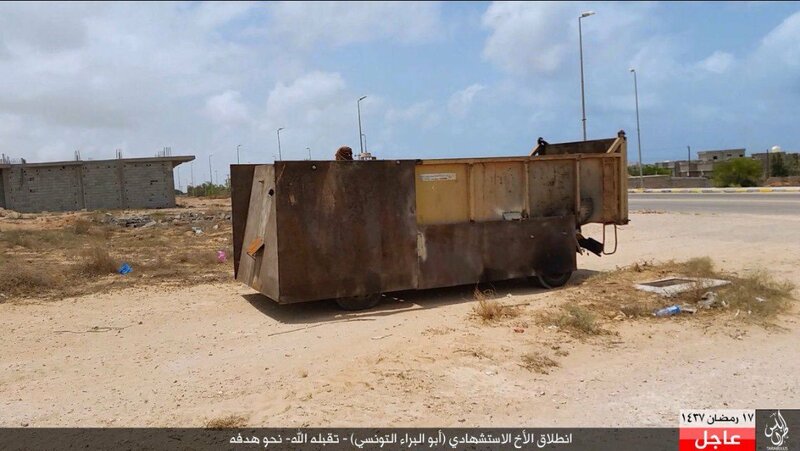 The first example of this standardised design appeared in an IS photo report from late February that documented an SVBIED attack in Benghazi’s southern Hawari district. Later, more examples would be captured in Sirte and Benghazi, and more would be used by IS in the country’s East. In total, at least 6 identical examples have been documented. This design features a complete armor kit that covers the entire vehicle extensively, with large steel plates welded together to the front and sides of the vehicle. A key visual characteristic connecting all vehicles is the design of the side edges of the windshield armor. Looking closer at the armor of these vehicles, it becomes clear that it’s actually more extensive than it appears at first. 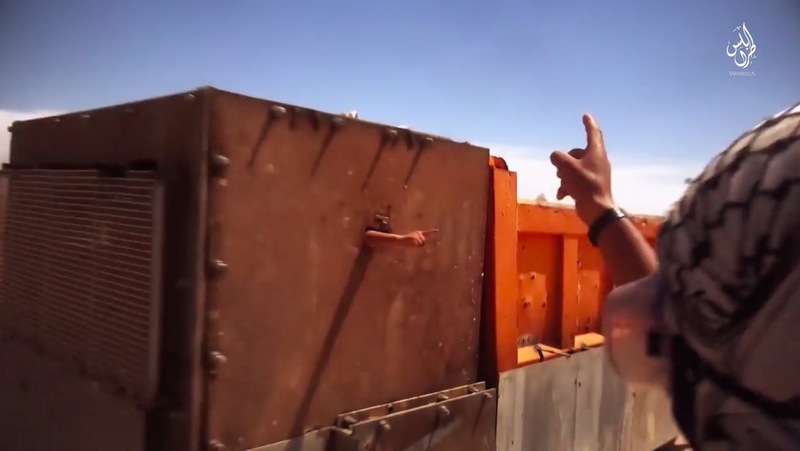 One example, included in an official IS video from the Eastern Barqah province released in late August 2016 clearly showed the intricate armor design. While most of the side armor consisted of two layers of steel pipes and an outer steel plate layer, the door featured a single steel pipe layer with an outer layer of two spaced steel plates. This comparatively high degree of armor was rarely seen by IS in Syria and Iraq, who usually restrained themselves to applying a single armor layer of steel plates. However, the use of steel pipes as armor is an interesting feature. Another up-armored pick-up truck SVBIED featured in a September 24, 2017 official IS video release from Barqah province had received an armor kit consisting almost solely of steel pipes mounted all over the vehicle. 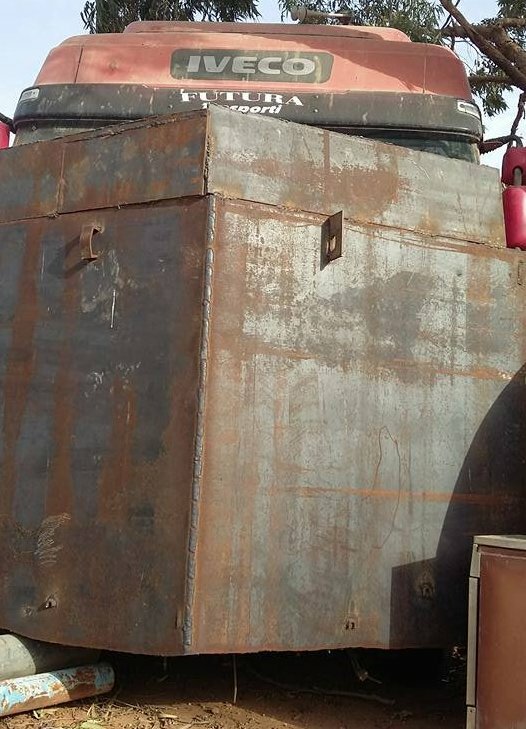 Steel pipe armor kits are quite rare, even for IS in Syria in Iraq. However, it’s been used more than once before. One of the first recorded instances of an up-armored SVBIED used by IS in Syria (then ISIS) was an IS up-armored SVBIED based on a BMP-1, used against Syrian loyalists in the final push to capture the besieged Menagh airbase in Northern Aleppo countryside in early August 2013. Its armor consisted almost exclusively of steel pipes. Another, more recent appearance was in late February 2018, when an IS up-armored pick-up truck SVBIED with complete steel pipe armor was used against YPG near al-Bahra village in the Deir ez-Zor countryside. But, let’s return to Libya. The appearance of identical pick-up truck SVBIED designs in multiple, geographically separate locations across Libya indicates the presence of multiple SVBIED manufacturing facilities that have actively communicated with each other and agreed upon specific schematics for manufacturing this specific SVBIED design. The acquisition process for this information could have taken place in a number of ways. As was said before, several senior IS figures from Syria and Iraq were sent to Libya specifically in order to set up the Libyan wilayat. Libyan foreign fighters with IS in Syria and Iraq were also dispatched to their home country in order to facilitate the territorial spread of IS there. It’s possible that one or more people knowledgeable with the manufacturing process of SVBIEDs were sent to Libya in order to hasten their territorial expansion. It’s also possible that IS may have co-opted personnel with knowledge of SVBIED manufacturing from other Libyan non-state actors, such as Ansar al-Sharia – which dissolved after substantial defections to IS and large casualties sustained during fighting with the LNA in Benghazi. In this category I’ve chosen to include both medium as well as heavy trucks, so as to not dilute the article further. Heavy trucks made up 8 of the (S)VBIEDs documented in the data set, constituting the second largest category. Continuing with the theme from the previous category, a pattern of identical design similarly emerged among the heavy trucks. 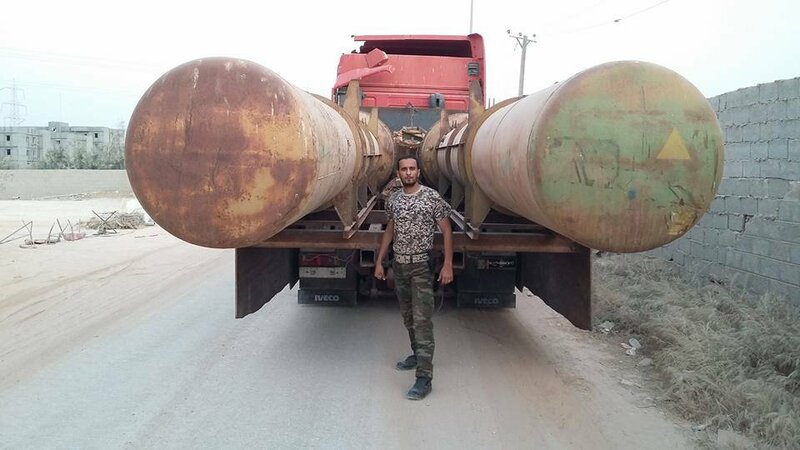 During a period of less than a month during the battle of Sirte in mid-2016, three almost identical heavy trucks were used by or captured from IS. The first example was featured in a May 29 2016 official IS video release from its Tarabulus media office, and featured a comprehensively up-armored heavy truck with frontal slat armor employed against Libyan Dawn forces West of Sirte. A little more than a week later, a visually similar example got stuck in a trench close to Sirte and was subsequently captured. Two weeks later, IS employed another example in Sirte. In all examples, it appears as if the driver’s cabin had been partially removed, giving the up-armored SVBIEDs a lower profile when conducting offensive attacks. 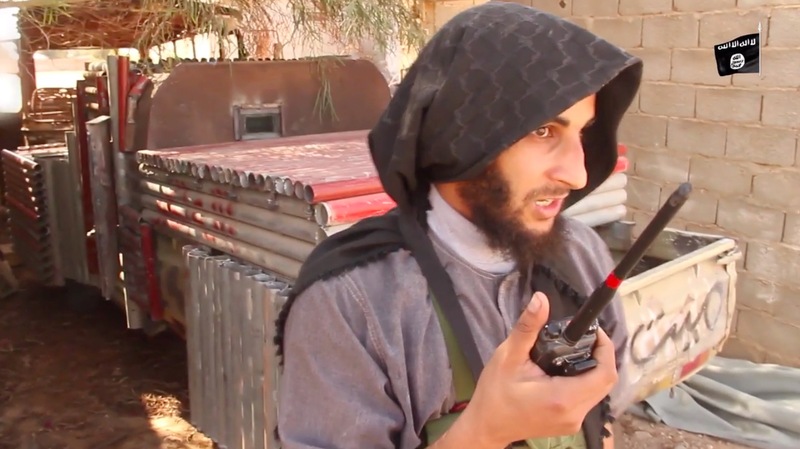 Again, this is a strong indication of the existence of standardised armor kit designs with IS in Libya. This has been observed countless times with IS in Syria in Iraq, with larger population centres (Mosul, Raqqah, Deir ez-Zor) more often responsible for manufacturing higher quality standardised SVBIEDs. The existence of identical SVBIED designs is also a sign of a certain degree of ‘industrialisation’ on the part of the SVBIED manufacturing process. In Libya, it appears the SVBIED manufacturing facilities located in Sirte and Benghazi were responsible for the most qualitative (and quantitative) SVBIED output – likely due to a combined increased availability of necessary resources as well as elevated fighting in these locations. Other than these identical designs, IS in Libya have manufactured some remarkable (S)VBIED outliers design-wise. 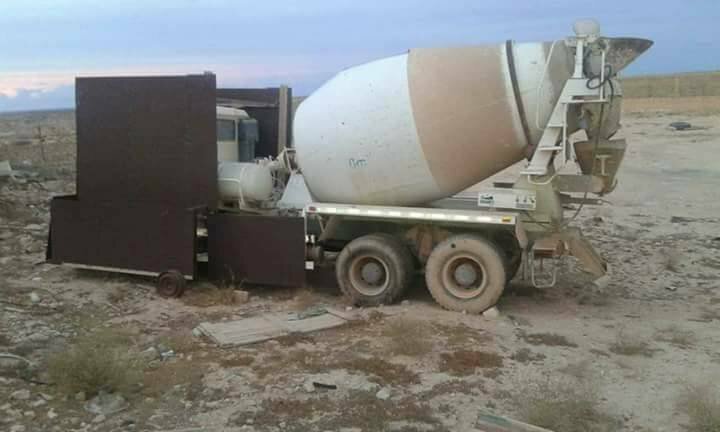 For example, in late 2016 an up-armored SVBIED based on a cement-mixing truck was captured by LNA near Benghazi. The most fascinating (S)VBIED in this entire data set was an up-armored remote-controlled VBIED (RC-VBIED) based on an IVECO heavy truck that was captured by LNA near Benghazi in late April, 2016. 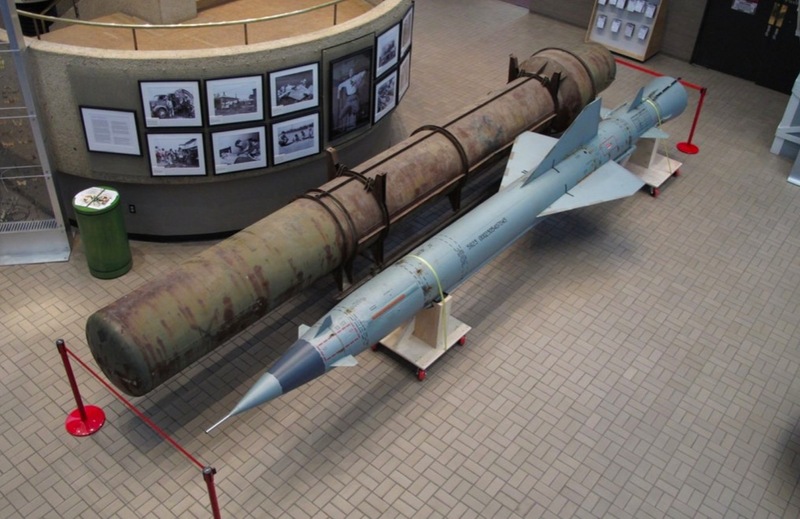 The huge metal tubes fitted as payload to the rear truck bed were actually S-75 ‘Dvina’ (SA-2) Surface-to-air missile (SAM) transport tubes, as pointed out by a number of Twitter users. Image showing an S-75 missiles next to its corresponding transport tube. Although the S-75 missiles weigh in at around 2300kg (5100lb), the explosive warhead itself weighs in at “just” 200kg (400lb). Logically speaking i wouldn’t make sense to have S-75 missiles in both tubes (400kg (880lb) of explosive payload exchanged for 4200kg (9300lb) of dead weight), but the lack of imagery makes it impossible to determine whether the transport tubes mounted to the back of this RC-VBIED actually contained S-75 missiles or not. For reasons that will be discussed later in this article, it’s actually a very real possibility that the tubes contained S-75 missiles. 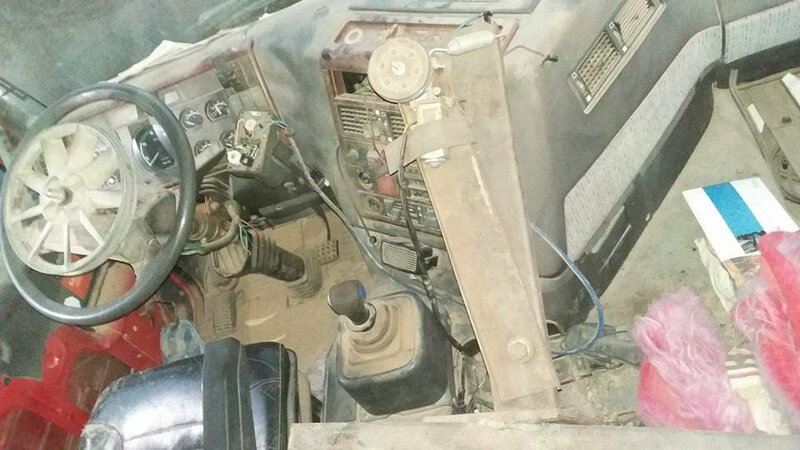 A photograph from inside the driver’s cabin showed what looked like an incomplete set-up for a remote-controlled VBIED (RC-VBIED). Despite repeated fear-mongering claiming that IS were developing RC-VBIEDs featuring “mannequins with self-regulating thermostats”, IS have only ever included a single RC-VBIED in their official videos, out of thousands of (S)VBIEDs claimed in recent years. Due to its relative inefficiency compared to SVBIEDs, RC-VBIEDs are far more likely to be used by non-state actors whose ideologies aren’t as radical as IS (see: Jabhat al-Nusra/HTS, and Ahrar al-Sham). A single up-armored front-end loader was included in the data set used for this article. It was featured in the May 18 2016 official IS video release from Barqah province in Eastern Libya, and was used near the northern coastal city of Derna. The use of heavy construction equipment such as front-end loaders or bulldozers in conjunction with or as SVBIEDs is an extremely important tactical asset when employed by non-state actors. The frontal bucket serves a dual purpose; other than functioning as extra layers of frontal armor, it can also be used to move obstacles (such as concrete blast walls, earth berms, and other debris) out of the way, allowing it to pass through and detonate where other SVBIEDs would be unable to. Front-end loaders are used more commonly as they’re faster than bulldozers. The use of front end-loader SVBIEDs has been widely documented by IS across Iraq, with bulldozer SVBIEDs primarily seen in Syria’s Deir-ez-Zor. 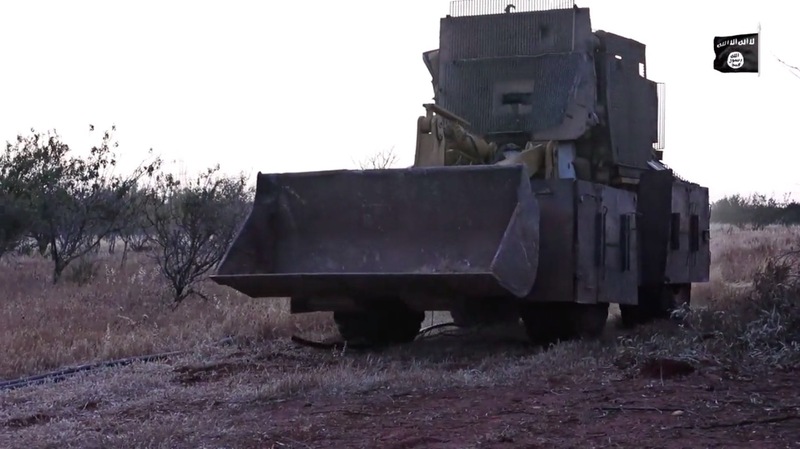 In Syria, Jabhat al-Nusra also used a front-end loader SVBIED in the Damascus suburb of Eastern Ghouta in mid-2018. The overwhelming majority of all covert SVBIEDs and parked VBIEDs used by IS in Libya have been either pick-up trucks, SUVs, or other types of normal cars. Up-armored SVBIEDs are used exclusively on the frontlines where the fighting is particularly intense in order to initiate offensives or stave off enemy advances. 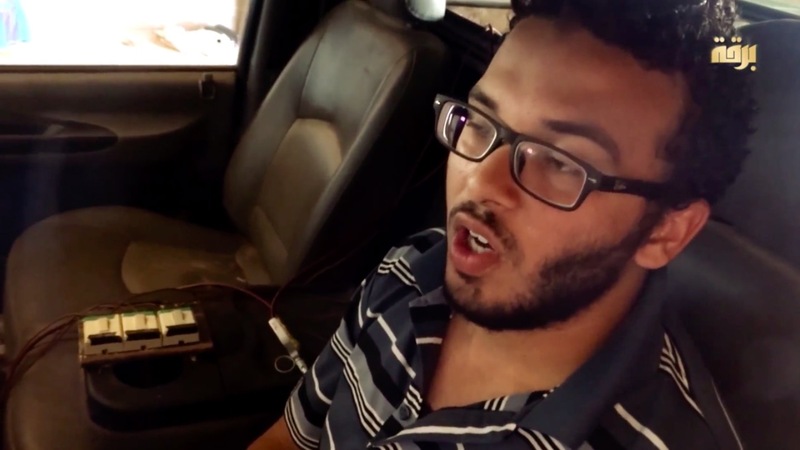 An example of a parked VBIED was defused in Benghazi in May, 2017. It featured an explosive payload consisting of artillery shells and anti-tank mines. The way IS designs and sets up the explosive payloads of their SVBIEDs in Libya is rather unique. 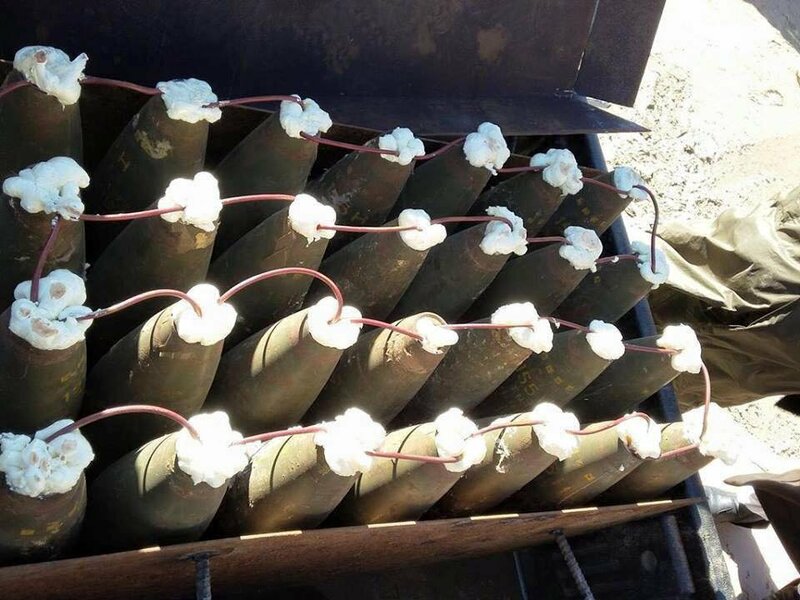 IS in Syria and Iraq primarily used military munitions in their older SVBIED payloads, before transitioning over to exclusively using mass-produced multi-purpose IEDs cut from cylindrical steel pipes. IS in Libya never transitioned. Ever since they started employing SVBIEDs back in early 2015, they’ve consistently used payloads consisting almost exclusively of military munitions. Everything from unguided air-to-ground bombs, to artillery shells and obscure anti-tank mines. But most commonly – daisy-chained 155mm artillery shells. Payload of an up-armored SVBIED captured by Libya Dawn forces near Sirte in July, 2016. Payload of an up-armored SVBIED captured by LNA in Benghazi in early January, 2017. 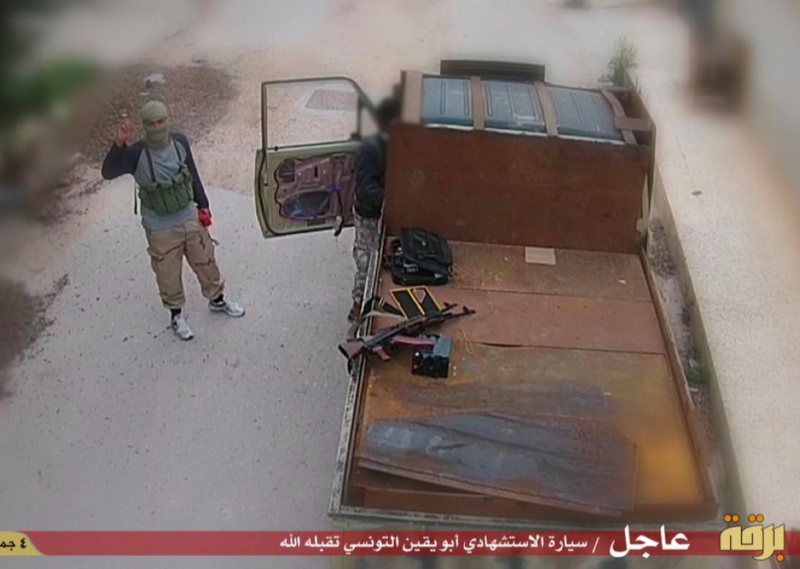 IS up-armored pick-up truck SVBIED used in Benghazi on March 23, 2015. 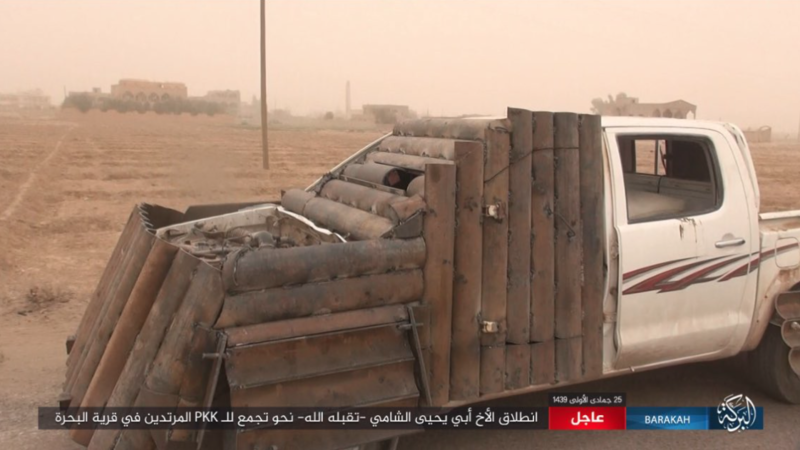 Covering the rear truck beds with steel plates was a practice commonly used by al-Qaeda in Saudi Arabia around 2003-2006, although they exclusively used mixed powder payloads that essentially rendered the encapsulated rear truck beds into large IEDs. Another recurring feature of Libyan SVBIEDs manufactured by IS has been the use of insulation foam in order to fix the payload (read: artillery shells) into place. This practice is extremely widespread within Libya, but hasn’t seen much use with IS contingents in other countries. The interior of an IS covert SVBIED featured in a July 4 2018 official IS video release from Barqah province in Eastern Libya. Unguided air-to-ground munitions have also seen comparatively high levels of use in SVBIED payloads by IS in Libya. Specifically, the Soviet OFAB-100M, an unguided air-to-ground munition weighing in at 121kg (270lb), with an explosive payload of 35kg (80lb). OFAB-100M air-to-ground bombs fitted as part of an SVBIED payload. March 27, 2015 – Benghazi/al-Leithi area. OFAB-series aerial munitions have rarely been used in SVBIED payloads by IS in Syria or Iraq, with one known exception. 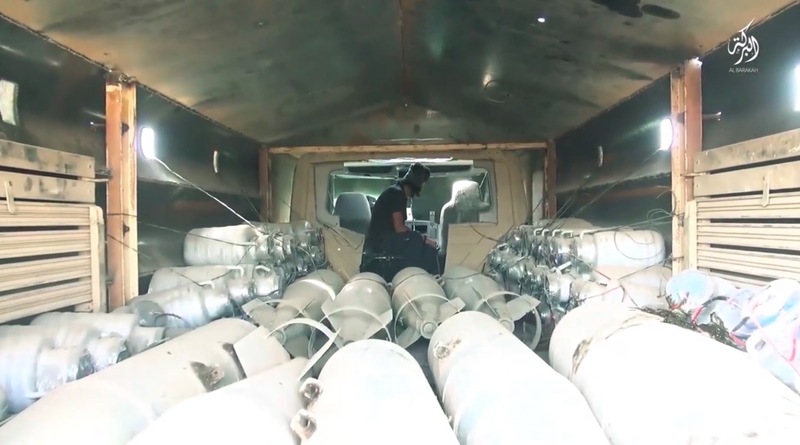 An SVBIED based on a heavy truck that was featured in an official IS video release from Syria’s northeastern Hasakah province from early September 2016 carried an explosive payload that featured a number of FAB-500 M62 unguided bombs. One of the identical heavy truck SVBIEDs that was captured near Sirte in mid-2016 (the one that got stuck in a trench) also featured a payload consisting of unguided aerial munitions, but not from the OFAB-series. 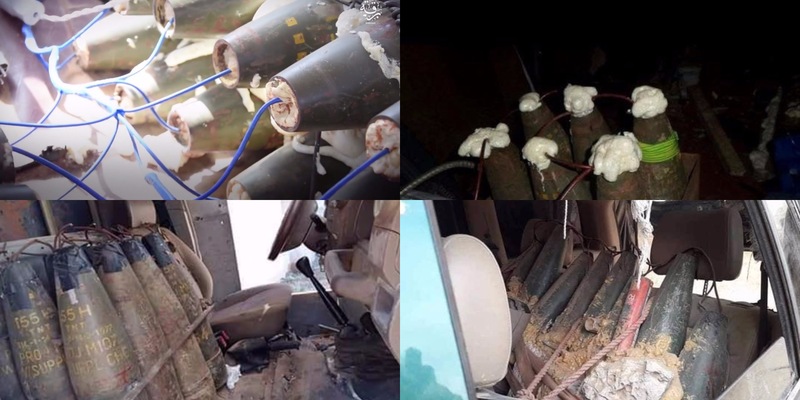 So, why have IS in Libya consistently used military munitions for their SVBIED payloads instead of IEDs? The answer is fairly straightforward and logical. 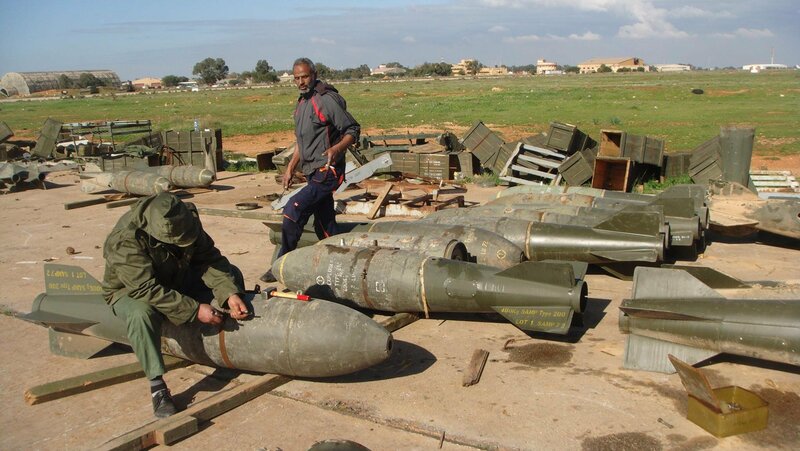 There’s simply a much greater abundance of military munitions in Libya. 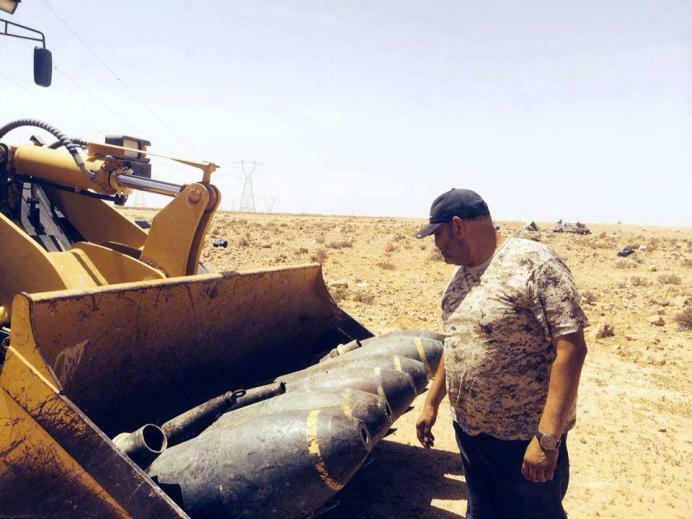 The initial Libyan Civil War in 2011 resulted in large quantities of munition stockpiles disappearing, and also lead to unexploded ordnance littering the country as a result of the NATO air campaign. You could scavenge explosives from the military munitions, but that’s adding an extra step with more dangers. Hence, it would make sense to first deplete whatever military munitions you have on hand before commencing manufacturing of multi-purpose IEDs. And they don’t appear to be running out any time soon. 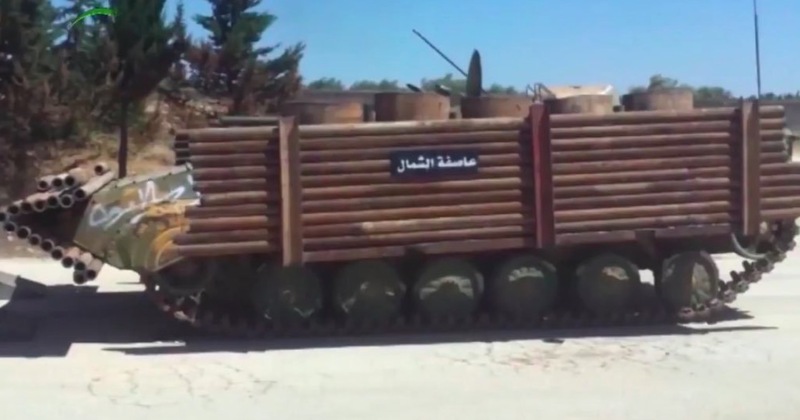 This also ties back to the S-75 transport tubes used as payload for the heavy truck RC-VBIED discussed previously. 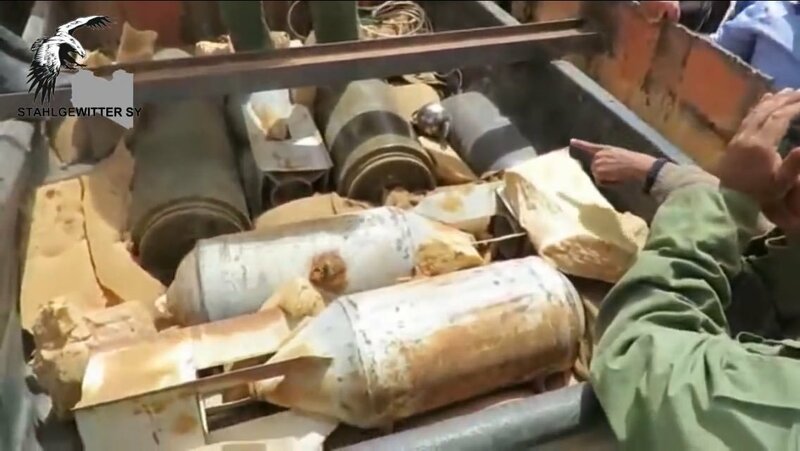 Seeing as IS in Libya have practically only ever used military munitions as explosive payloads for their SVBIEDs, it would make more sense for the transport tubes to have contained actual S-75 SAMs. When it comes to covert and parked (S)VBIEDs, there’s typically also an attempt at gearing the design of the explosive payload in a covert direction in order to avoid detection by opposing forces prior to the intended time/point of detonation. 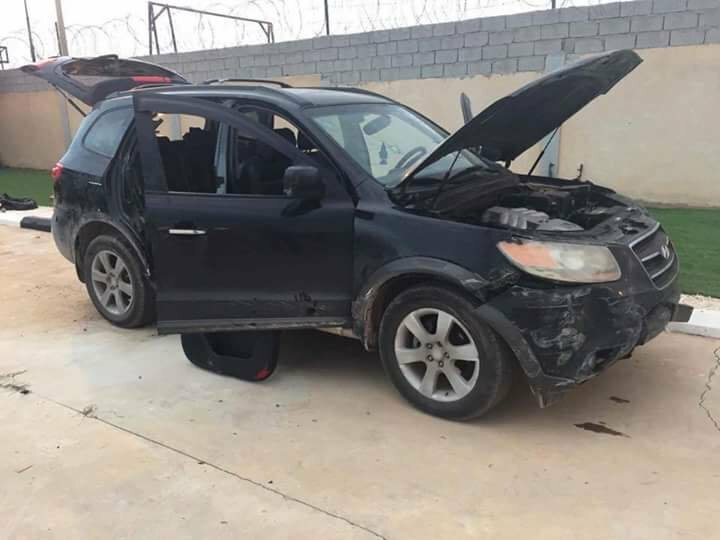 One such example (a black SUV) was discovered and dismantled in Misrata in October, 2017. The design of the payload was fascinating, as IS had gone the extra mile in order to both increase the lethality and hide the way they’d done that. 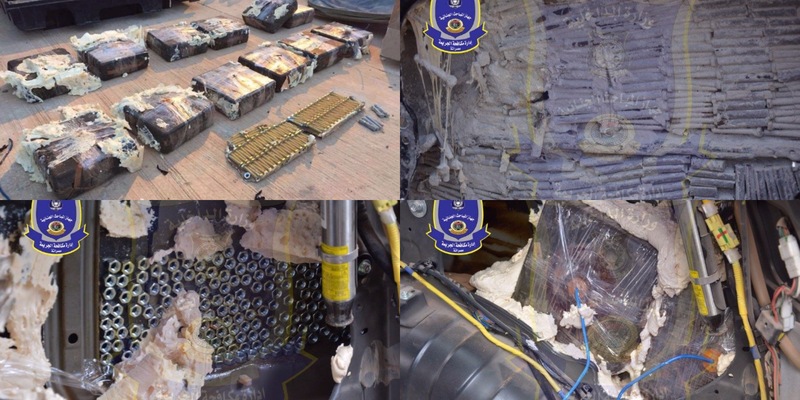 The bulk of the explosive payload was made up of 12 Belgian ‘PRB M3’ anti-tank mines, each with an explosive content of 6kg, giving the (S)VBIED a total explosive payload weight of 72kg (160lb). In addition to the obscure anti-tank mines, IS had fitted the inside of the doors of the vehicle with steel nuts and bolts in order to achieve a higher degree of shrapnel dispersion and maximise casualties. Like in Syria and Iraq, IS in Libya have employed “standard” SVBIED detonation mechanisms, featuring safeties and often times multiple firing switches. Sometimes grenade fuze redundancies are also fitted to the vehicles. However, seeing as the design of the mechanism itself was never properly standardised (like the white box detonation mechanism standardised by IS in Syria and Iraq) it’s often quite difficult to determine the functions of different switches mounted as part of a detonation mechanisms. Still, some progress has been made design-wise. Here, a covert SVBIED included in an April 2015 official IS video release from Benghazi appears to have been fitted with three firing switches on separate firing circuits, along with a grenade fuze redundancy. 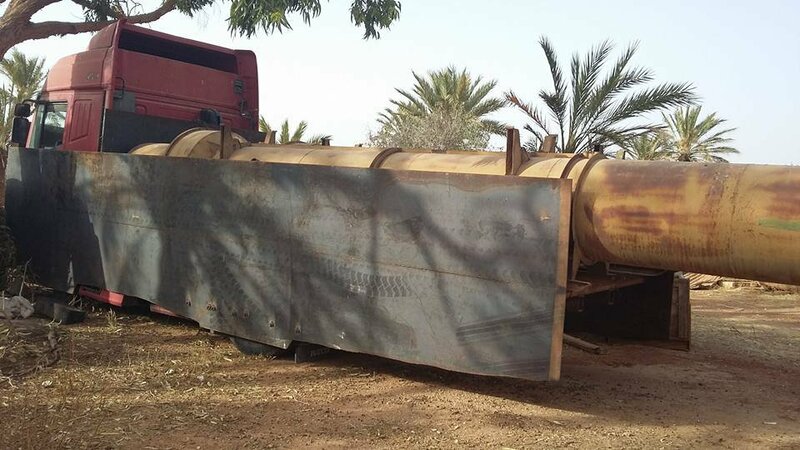 Another covert SVBIED based on a flatbed truck that was featured in an official IS video release from the same area (Benghazi) just a month later, featured a completely different detonation mechanism design. This example included two sets of safeties, each connected to their own set of two firing switches wired on separate firing circuits. 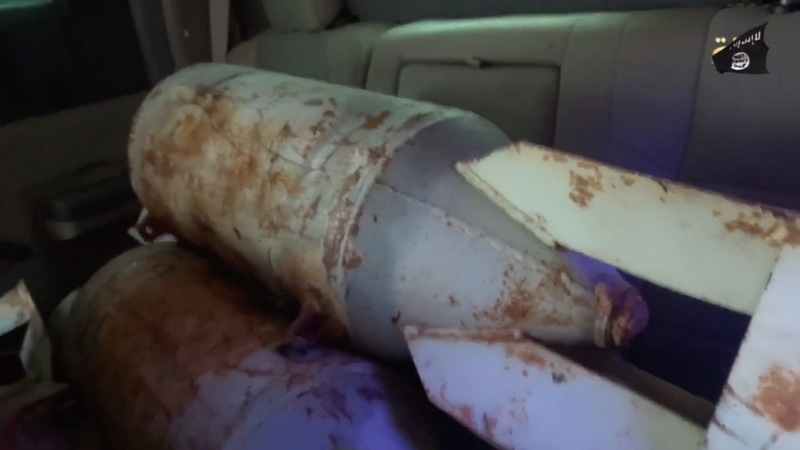 Looking at more recent examples by IS in Libya, such as the one below from a July 4, 2018 official IS video release, one can see that there’s been some improvement of the detonation mechanisms design-wise. The below example appears more visually similar to the standardised white box detonation mechanisms employed by IS in Syria and Iraq, but the functionality appears limited with just a single safety and firing switch as well as a grenade fuze redundancy. In designing SVBIED detonation mechanisms, one tends to go overboard with multiple sets of firing switches and redundancies, for a “good” reason. The purpose is to ensure that the driver of the vehicle is able to detonate the payload when he’s meant to. 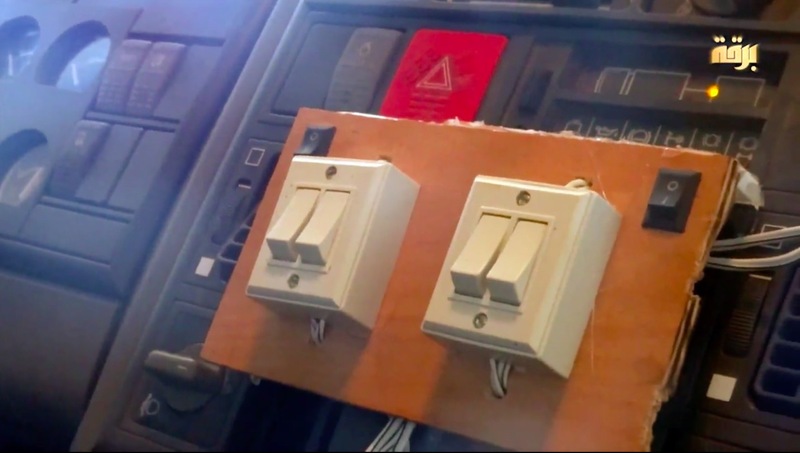 Relying on a single safety and firing switch is a risky move, seeing as a tiny piece of faulty wiring can be the difference between a successful and failed SVBIED attack. Multiple sets of firing switches on separate firing circuits would bypass that issue and act as a fail-safe in case a problem arises. Up until late 2016, the only way IS in Syria and Iraq had been using hobby quadcopter drones was in order to film cinematic shots, and sometimes to film SVBIED detonations from afar. However, something changed as the battle of Mosul commenced. Suddenly, IS started attaching remote SVBIED support teams equipped with hobby quadcopter drones (often commercial DJI variants) to most offensive SVBIED attacks in the city. As the SVBIED made its way towards the Iraqi forces, the driver would be communicating with the support team over radio, who would follow him with the drone, directing him through the narrow streets. This meant that the driver was able to bypass roadblocks, circumvent emerging threats, and choose the path of least resistance to the chosen target. Using this method, IS in Mosul alone were able to conduct more than 130 successful SVBIED attacks against Iraqi units. 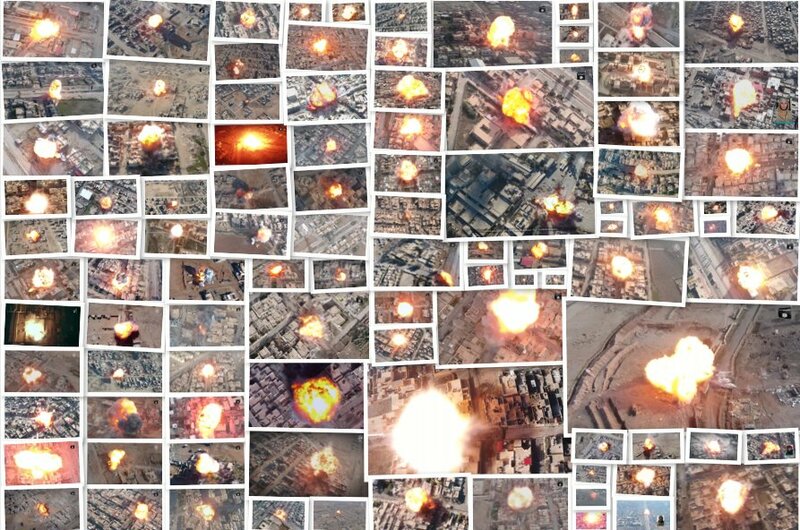 A collage showcasing 100 succesful SVBIED attacks conducted by IS during the battle of Mosul. Since the battle of Mosul, SVBIED support teams with drones have been used in Raqqah, in the Syrian desert, around Deir ez-Zor, as well as in the remaining Hajin pocket. However, its use outside of Syria and Iraq has been sparse. In fact, the only IS satellite wilayat to have recorded SVBIED attacks with drones is the Libyan provinces. The composite image below shows all SVBIED attacks recorded with hobby drones by IS in Libya. IS in Libya were actually early with their use of drones to film SVBIED attacks. 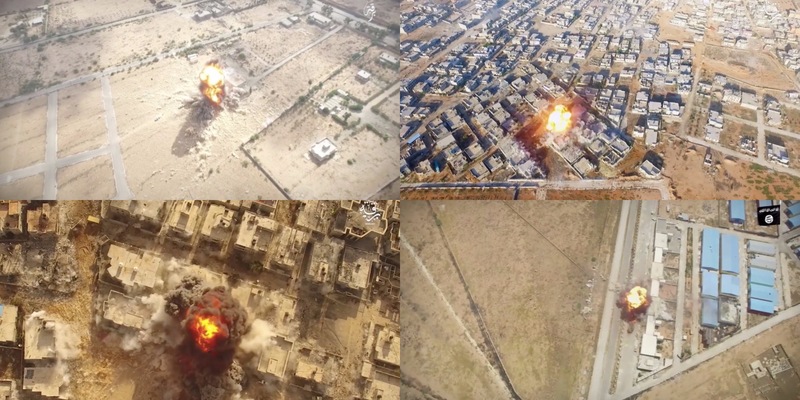 Two of the drone-recorded SVBIED attacks were featured in an August, 2016 official video release, with the other two included in an official video release published more than a year later in September, 2017. Both video releases were from Barqah province in the country’s East. Although it’s difficult to confirm whether the drones were used in an active support role or just for propaganda value without concrete evidence, there are signs that the former is more likely. In almost all of the shots, the drone follows the SVBIEDs, and either tracks its approach toward the target, or already hovers close to the target. Both of these factors point to the existence of Libyan SVBIED support teams, but it’s still not possible to confirm. The IS contingent in Libya was able to set up an SVBIED program spanning both of their coastal Wilayat (Tarabulus & Barqah) fairly quickly after the provinces were announced, aided in part by the presence of a senior IS delegation and Libyan foreign fighters returning from Syria & Iraq. A high degree of coordination and communication across the Libyan network of SVBIED manufacturing facilities is apparent, with workshops in different parts of Libya able to construct and employ identical SVBIED designs with standardised armor kits. This, in and of itself, signifies a comparatively high degree of industrialisation of the SVBIED manufacturing process. However, the use of slat armor has been very limited, with almost no use of frontal slanted armor. Nonetheless, the occasional use of spaced armor is an interesting phenomenon. 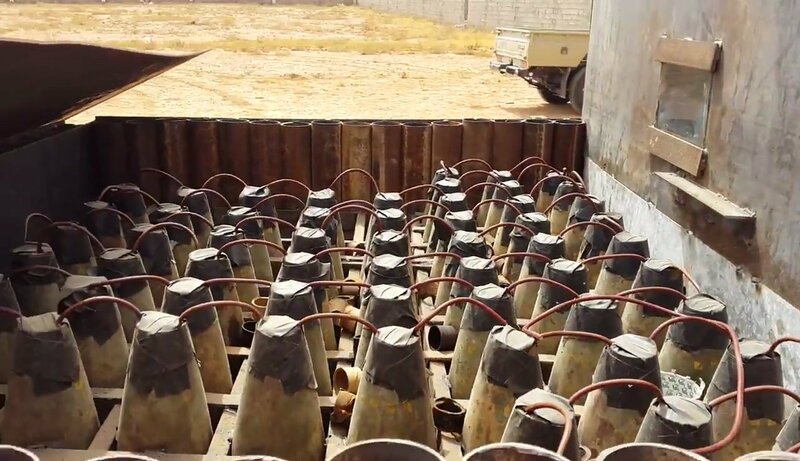 The continuous use of military munitions such as air-to-ground bombs, artillery shells and anti-tank mines should be seen more as a result of the abundance of these munitions than as a deficient part of the SVBIED manufacturing process. Furthermore, the SVBIED detonation mechanisms are what you might expect; the standard set-ups with varying degrees of complexity and redundancies. The existence of Libyan SVBIED support teams, if confirmed, would significantly elevate the tactical prominence of Libyan Wilayat in relation to the offensive use of SVBIEDs. In summary, the SVBIEDs of IS in Libya were and are of impressively high quality. The knowledge surrounding these remains documented in their official videos, and likely in the minds of some surviving Libyan IS fighters. One of the main factors that benefitted and facilitated the inception of IS in Libya was the lack of control either of the warring parties were able to project. It shouldn’t be viewed as a coincidence that IS Libyan stronghold of Sirte and its surroundings was situated approximately where the frontline between the LNA and the Libyan Dawn coalition was situated in northern central Libya. Despite having had their overt presence forcefully removed, IS in Libya live on as a persistent threat patrolling the desert hinterland – occasionally striking from the shadows. 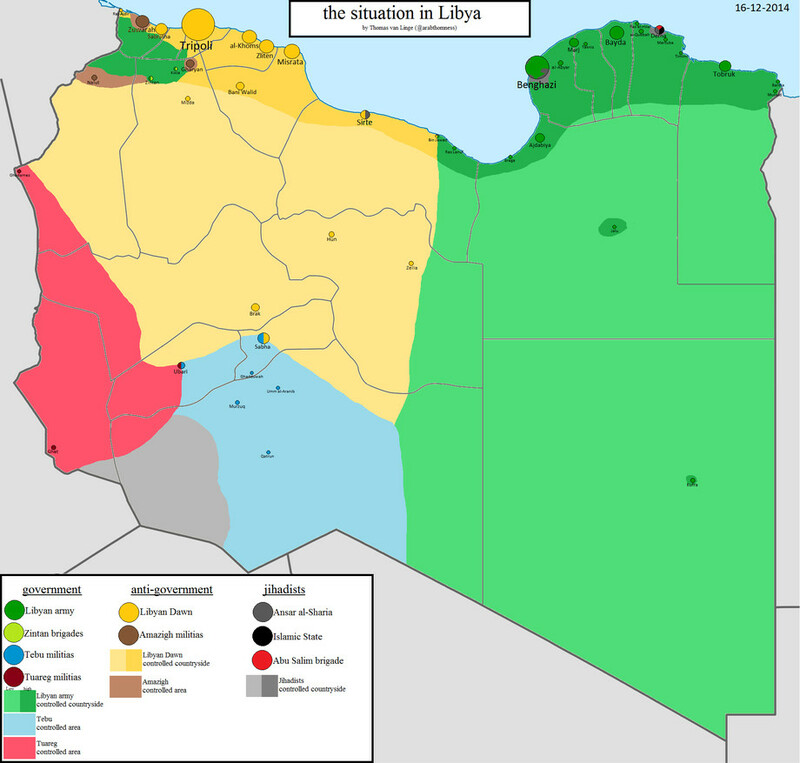 Although unlikely in the near future, the possibility of an ascending IS contingent in Libya shouldn’t be discontinued.